It's #WeddingWednesday again! I've been wanting to write this piece for a long time since the First Look topic arises some of the biggest questions clients face when we're planning their wedding photography timeline. The #FirstLook is an intimate moment of the couple before the ceremony starts. I've seen an increase in these sessions lately, probably because the couples want to stop, breathe and share a moment together before all the wedding day chaos begins. So, what is it? The couple schedules a moment to see each other in private, with just the photo & video team so they can capture an intimate moment. 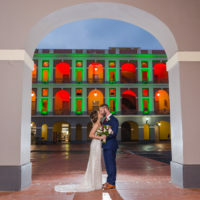 After seeing each other and expressing their excitement or emotion, we take advantage of the moment to do the couple photo session right there before the Ceremony. I like to do my first look sessions having the groom facing the camera, and having the bride walk towards us from the back. This means that no one sees each other until they’re right beside. Once the bride taps the groom’s shoulder, he turns around to see his gorgeous fianceé right beside him. For the following minutes, I take a few steps back and let them have the moment to themselves. Get back your cocktail hour. Scheduling the first look and doing all the couple photos on your wedding date ensures you'll be able to enjoy your cocktail hour with the guests because there's no need for a newlywed session after the ceremony. Addition of formal group portraits. Most clients also ask their wedding party and immediate family members to meet them 20 minutes after the first look to do all the formal portraits before the Ceremony as well. An extra emotional moment to cherish years after. By allowing this space to happen, you have a memory of the wedding day that only exists for you both. Many couples are concerned that having seen each other would dilute the emotion in the Ceremony, but I've seen grooms cry their eyes out when they see the bride walk down the aisle, minutes after their first look, so I think of it as just a myth. Some couples use the moment to read a letter from each other, have a moment of prayer, a gift exchange, or to say their vows in private. Most just hold each other tight, and that's OK too! Make it yours! Most hair and makeup artists use the Ceremony time as their reference when deciding their start time. If you're considering doing a First Look session, please remember to communicate your need to be ready earlier to the makeup & hair artist, and to make additional transportation arrangements if the First Look is happening in a different location. I can't stress enough how important it is to get the whole vendor team acquainted with the timeline. Logistics (You have to be ready earlier). Depending on the locations, I'll work out on a timeline that helps us be timely and use the time in our favor. But usually, scheduling the First Look means being ready an hour earlier than usual, so there are plans to be made in terms of transportation and styling. What if we're too Traditional for a First Look? You can still have a moment alone together, just not looking at each other. Some couples have had their eyes blinded or just hold hands over the edge of some corner. Of course, couple photos would still need to be taken after the ceremony. Well, hope this post was helpful! I'll surely be linking to it a LOT during the planning stages with my clients. Thanks for visiting! I'd love to hear you brides-and-grooms-to-be: what do you want me to talk about in the following #WeddingWednesdays? I'm all eyes.